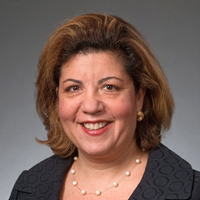 Mariam Georgaroudakis, SCM Commodity Manager; Raytheon Co.
Mariam Georgaroudakis is responsible for sourcing and managing supplier relationships supporting Facility Services Agreements at Raytheon Co. The Facility Services Agreement portfolio includes: Chemical Management Services, Food Services, Resource Management, Hazardous Waste Management, Security Services, Furniture and Janitorial Services. She has worked for Raytheon for 28 years and within Corporate Supply Chain for the past eight years. Her cross-function business experience in Production, Manufacturing, Program Finance, Internal Audit, and Business Development have provided her with a solid background with which to understand internal stakeholder requirements as she leads strategic sourcing opportunities for the company. She has a Bachelor of Science degree from American International College and an Master of Science degree from Boston University.